» Traditionally an oath is either a statement of fact or a promise with wording relating to something considered sacred as a sign of verity. 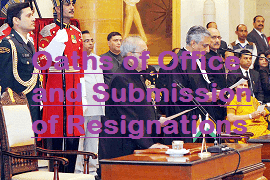 » Oath to the various Offices in India are administrator by others offices. » Similarly the process of resignation is followed. » Below is the list of various offices and corresponding oath administrators.